A Mismatched Putting Stroke: Is it Detrimental to Your Putting? It is possible to vary the length of your back and forward stroke independently of each other. 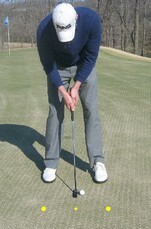 However, a matched putting stroke helps with good stroke tempo and distance control. How important is it that the length of your backstroke matches the length of your forward stroke? Should you even worry about the length of your stroke either side of the point of impact? Tiger Woods is quoted as saying that when he is putting well his backstroke and forward stroke are equal in length. If any one is shorter, it is not his forward stroke. If you watch the pendulum in a grandfather clock you will see that the movement back and forth is perfectly matched. As the clock winds down, the length of the arc shortens - but it is still matched either side of the centre position. If you use a putting stroke that uses your shoulders in a pendulum-like manner, must your backstroke match your forward stroke? In other words, must it be symmetrical in shape? It is logical to assume that the longer the length of your putt, the longer will be the length of your backstroke. A short putt requires only a short movement away from the ball; a longer putt requires more force to propel the ball to the hole. In gauging how hard to stroke your putt, there are two potential problems. The first is decelerating your putter at the moment of impact. This is typically caused by a stroke that is too long to too short. Realising that your backstroke has been too long, you quit on your forward stroke for fear of hitting your ball too far. The second is over accelerating your putter into impact. Realising that your backstroke has been too short, you power the putt in order to get the ball to the hole. Both problems are to do with your stroke tempo breaking down. The closer you can match the tempo of your putting stroke to that of a pendulum clock, the more evenly paced it will be. Tiger Woods believes that with a matched stroke his control of distance is better. Others believe that your forward stroke should be greater than your backstroke so that there is a guarantee that your putter is accelerating through the ball. The forward stroke to impact should be about one half of the time of the backstroke. Your stroke time should remain about the same for putts of all length. By focusing on the smoothness of your stroke, you can forget about a possible mismatched putting stroke. This is because a focus on your tempo will take care of basic stroke mechanics.